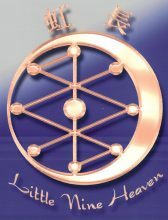 The Little Nine Heaven system consists of three skills: ju kung (nine chamber fist), chiankuan jen (swordmanship); and shih shui (bone marrow washing). Nine chamber fist has both the characteristics of strengthening the body actively and passively in a manner for self-defense. It is mainly based on the Confucian thoughts of the merging of heaven and man to transform one’s disposition. In skill, it is based on the Tao’s practice of the balancing between yin and yang to relax the tendons and bones, and to perform marrow washing. Even though its name translates to fist, it is actually an exclusive literature and a rich inheritance passed down through the centuries by word of mouth. The theory behind the nine chamber fist is in the exercising of the palms, fists, elbows, shoulders, waist, thighs, knees and feet. It implies the nine chamber evolution illustrated in the tai chi theory of the Book of Changes (I-Ching). The I-Ching is one of the earliest and deepest philosophical literatures written and it also explains the natural phenomenon of the universe. To many, hsian chi tien is the highest level of principles in the I-Ching. Tai chi is the combination of the natural activities and is the highest rule of the universe. The activities of nature are evolved from yin and yang. Tao consists of one positive element, yang, and one negative element, yin. One can think of yin and yang as the positive and negative in mathematics. According to Taoism, nature is the major universe and the human body the small universe. The kidneys are positioned at the waist and represent tai chi. From tai chi comes the two instruments. In terms of the human body, they are the two major tendons on both sides of the spine which go all the way down to the thighs. From the two instruments come the four phenomena which correspond to the four limbs. The two instruments also reach to the four terminals: tongue, teeth, nails and hair. From the four phenomenan come the eight diagrams (paqua). In relation to the human body, they are the four limbs and eight joints. There are 64 diagrams in the human body. The nine chamber fist originates its force from the waist, then to the two major tendons and then to the four limbs. This is called the method of mind. Then it flows from the four limbs and eight joints to the joints of the hands and feet. This is called the method of hands. There is also one other method called the method of steps.. This method uses the five elements (metal, water, wood, fire and earth) to represent the five organs (lung, kidney, liver, heart and spleen). The five organs radiate five chis. The five organs resemble auto parts, tendons and flesh resemble the body of the automobile and chi and blood resemble the gasoline. If the auto parts are out of order, a durable auto body or a full tank of gasoline is still unable to help the automobile function. All these phenomena are controlled by the “central vein,” which connects to the brain and down to the “life and death point” at the perineum. This is how the nine chamber is formed. The fist imitates the activities of nature and it is very close to Tao. It is therefore named the nine chamber fist. To analyze the fist from a physiological point of view, its very movements are based on the structures, positions, forms and functions of the tendons and bones, and the mutual relations between acupuncture points, chi paths and blood vessels. “Central vein” and the “bottom of the sea” are vital because they are the source of chi. The “bottom of sea” emanates chi to the entire body. By using various methods such as chi cultivating, chi exercising, chi terminating and chi holding, one can cultivate internal power and strength. This chi follows the paths to the links to prevent aging. For external strengthening, the method of “bear’s neck and bird’s stretch” is used to relax joints to prolong life. In the training of nine chamber fist, one does not merely concentrate on the external body strengthening but also on the cultivation of internal power. The Little Nine Heaven sword is long handled and composed of a pair of twin swords, fabricated together after the 12 earthly branches. This combines the five elements and seven stars. The sword is four feet two inches in length, with five reclined saw-teeth in the mid-section and seven reclined saw-teeth in the stem or rear section. In training, one is taught to use either one or two hands and to use the various strategies of all the short-range weapons. These include the hammer, staff, cudgel and knife. The various forms practiced include yin/yang sword, crane sword, snake sword, monkey (ape) sword, and the dragon sword. A student is taught to block and counterattack in one move and to use the tip, midsection and stem of the sword. This differs from the shaolin system of using only the tip. The sword exercises are simple and without complex patterns, but are highly effective against an attack. A student’s goal is to attain a high proficiency and flexibility in using the sword without having to rigidly adhere to formalities. A student of shih shui strives to unite his physical and chi or spiritual bodies as one. The system of shih shui consists of three levels: Transfer of the ching (sperm) to the chi; transfer of the chi to the shen (spirit); and cultivate the shen to return to the stage of shu (emptiness). By cultivating this chi into a higher form, one will be in harmony with nature and the universe. The many health benefits of shih shui include chi organ restoration, organ detoxification and nourishment of the vital organs through chi energy generation and storage. One can cleanse and build the blood, thus causing a reduction of the work the heart must do. Bone marrow will also be revitalized. The basis of Little Nine Heaven (Hsiao Chiu Tien) has been recorded in Chinese historical books as originating from the Nine Chamber scriptures written by the Yellow Emperor, Huang-Ti (2698B.C.-2598B.C.). Its theory is based on yin/yang, five elements and the constellations and positions of divinatory symbols. Its aim is entering Tao by way of skills. Huang-Ti is credited with improving upon the art of wrestling to defeat the rebellious tribal chieftains, thus bringing all corners of the land under control. This victory laid down a solid foundation of unity for the Chinese nation. Huang-Ti’s military feats and tactics were the beginning of China’s martial arts. Martial arts thrived and became a science in the Tang (A.D.618-906) and Sung Dynasties (AD 906-1127). The hand-to-hand fighting gradually developed into a science of boxing and later split into sects of internalism and externalism. The external system advocates firmness and strength benefiting bones and muscles, while the internal system advocates gentleness and grace, benefiting internal organs. Despite their differences, both systems are of the same origin. The Taoist, Wu Dao Zi of the Tang Dynasty, while adhering to the theories of Huang-Ti’s nine chamber scriptures, blended the static and kinetic self-defense functions of the birds, animals, insects and fish into one system. He established a school of boxing and swordsmanship that comprised the skills of wrestling, striking, seizing and kicking, along-with the skills of controlling chi and preserving the spirit through the cultivation of bone marrow washing. This school was named Little Nine Heaven Wu Tao. The students of this school were used to guard the temples of the Taoists priests. This is actually the origin of the present day Little Nine Heaven system.